There’s a new bread in town and it’s delicious! Dempster’s has recently launched the new Dempster’s Honey Wheat Bread for a limited time. It’s delicious for breakfast with a little bit of butter or honey. I also created these Honey Almond Breakfast Cups perfect for a lazy Saturday morning and couldn’t wait to try a Blueberry Brie Grilled Cheese Sandwich. 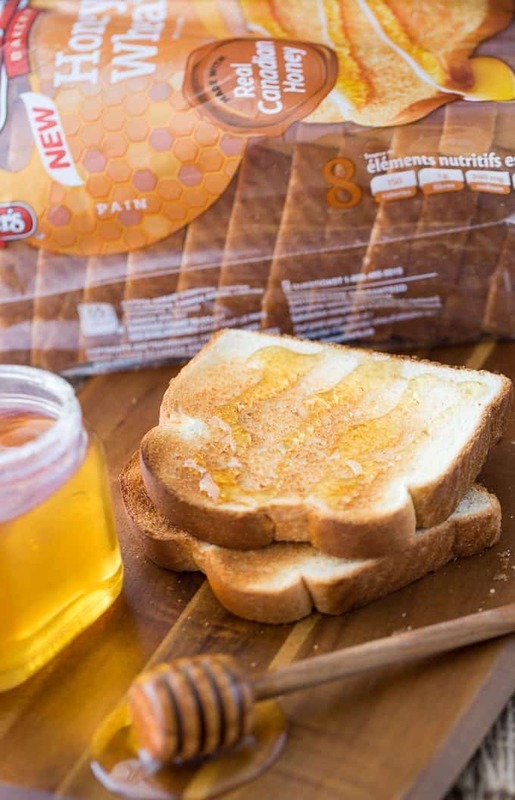 What’s unique about this new bread is that it’s made with Canadian honey. Honey right now is hot with its Canadian production at an all-time high. I often use honey in recipes as a replacement for refined sugar. You’ve probably seen lots of products with honey recently on your grocery store shelves. 1,504 honey related products have been launched between 2010 and 2015 and most are in the food category. That’s a lot of sweetness and I love it! Made with real Canadian honey, Dempster’s Honey Wheat Bread also has no artificial flavours or colours. Grab a loaf on your next shopping trip! Don’t wait too long to try it because it’s only available until June 14, 2017! I was inspired to create something sweet with the bread, but wanted a recipe that you could also eat for lunch. I could have done a regular grilled cheese sandwich which are always a hit in my home, but I wanted something a little different. I came up with the most decadent, mouthwatering dessert grilled cheese sandwich you’ll ever have. 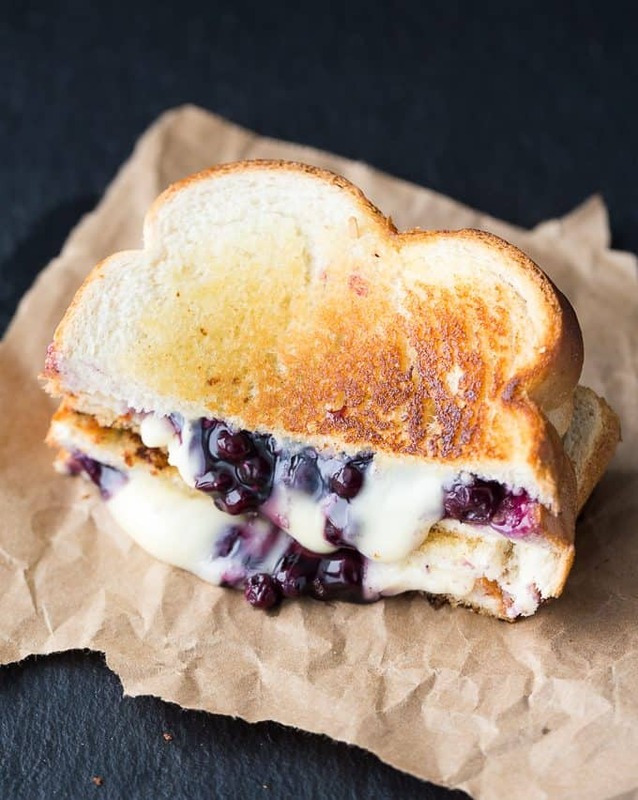 Meet the Blueberry Brie Grilled Cheese Sandwich. You’ll think your lunch is actually dessert! It’s the best of both worlds. You may be thinking cheese and blueberries and not sure if that combination works. Let me tell you that it does and it works WELL! Brie cheese complements blueberries perfectly. I knew it would work because I’ve made tarts with blueberries and Brie in the past and loved the flavour combination. I couldn’t have picked a better bread for this recipe. 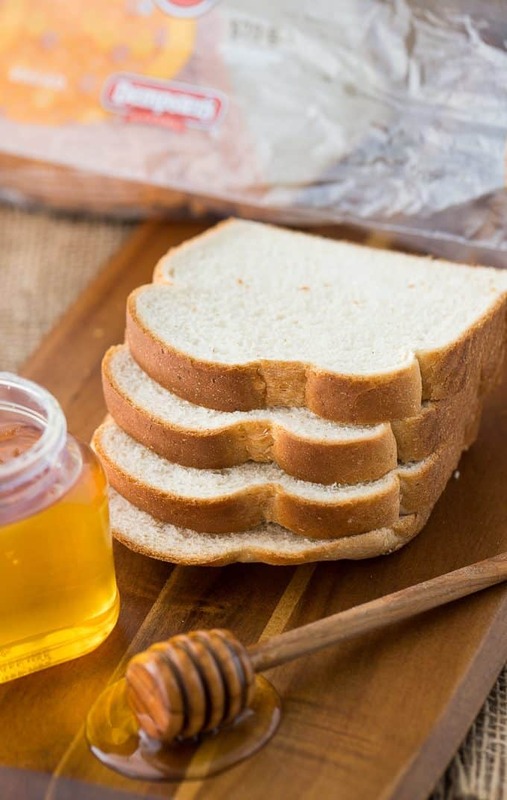 Dempster’s Honey Wheat Bread has a rich, buttery taste and the hint of honey is exactly what you’ll want for this simple recipe. It may look complex, but it’s so easy to make. My family gobbled these sandwiches up for lunch and then asked me to make more. Good thing I had a couple extra loaves of Dempster’s Honey Wheat Bread to satisfy their request. If you didn’t want to use blueberry pie filling in this recipe, you could switch it out for fresh blueberries or blueberry jam. I liked the extra sweetness of pie filling and I had some already in my pantry so that’s what I used for this recipe. 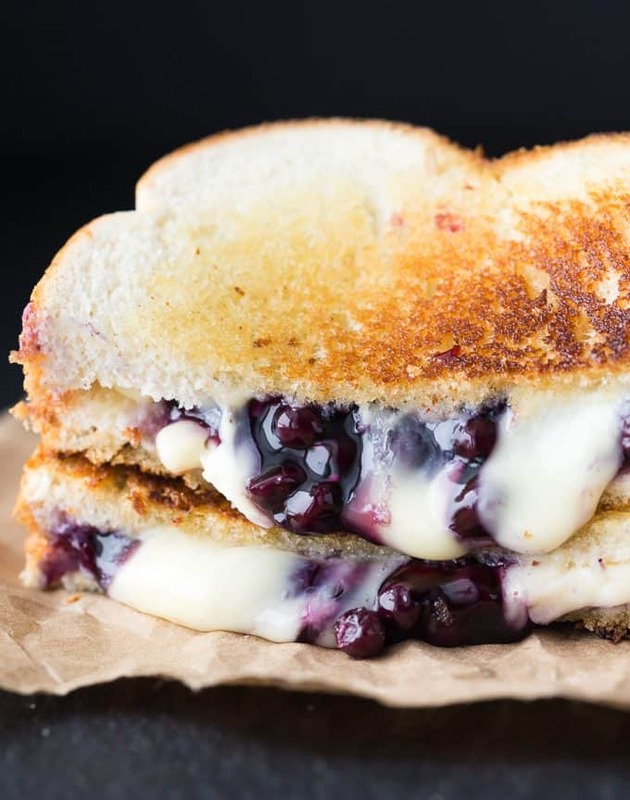 If you’ve fallen in love with this dessert grilled cheese, feel free to create other varieties. How about Apple & Brie Grilled Cheese, Caramel Apple Grilled Cheese Sandwich or a Honey Banana Grilled Cheese? Let your creative juices flow as you brainstorm new sandwiches to try. Have you ever made a dessert grilled cheese sandwich? If so, what kind is your favourite? Yes, lunch can actually be a dessert! Enjoy the decadence. On the non-buttered side, add toppings and cover with other slice of buttered bread. The buttered side should be facing outwards. Heat a skillet to medium-high heat. Grill each side for 2 to 3 minutes or until desired doneness is reached. Cut in half and enjoy hot! I’ve never had a sandwich like this before! I have had smoked brie, but not this. We enjoy grilled cheese sandwiches. I think this might blow my family’s minds, LOL. I don’t know if I would’ve ever thought of putting these two mixes together for a grilled cheese. It looks quite interesting and I know my family would love to try something like this so I will have to Grill it up sometime soon. Wow, that looks delicious! I love brie…and blueberries. I wouldn’t have ever considered a sandwich combining the two. Now that I’ve seen one though, I’m now craving it! I’m drooling over here at all the gooey yumminess! What a delicious combination and I love the use of the honey! YUM! 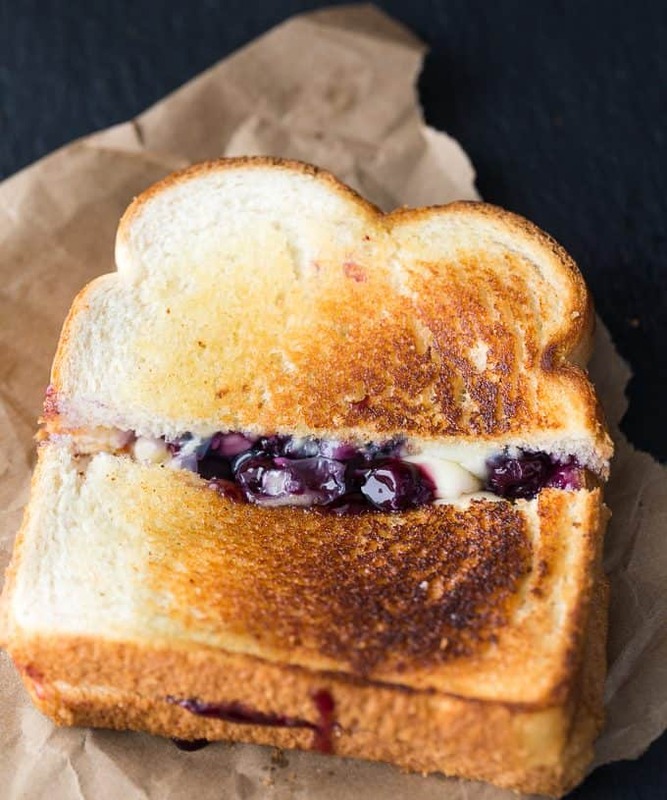 I love normal grilled cheese sandwiches so much, I bet this blueberry twist tastes amazing! Going to have to try it! WOW! This looks amazing. Adding it to the dinner rotation now! Oh yum…. what a great way to change up the plain typical grilled cheese. This would be a great meal to add to our meal rotation. I have been looking for some different lunch ideas. I will have to get the ingredients I need to make this on the weekend. I am sure it wil be a big hit. Something new and delicious for our Sunday brunch. This looks so delicious! 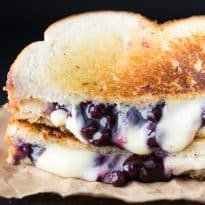 I’ve never had a cheesy sandwich made with brie cheese but it looks wonderful, especially when paired with blueberries! That looks amazing. 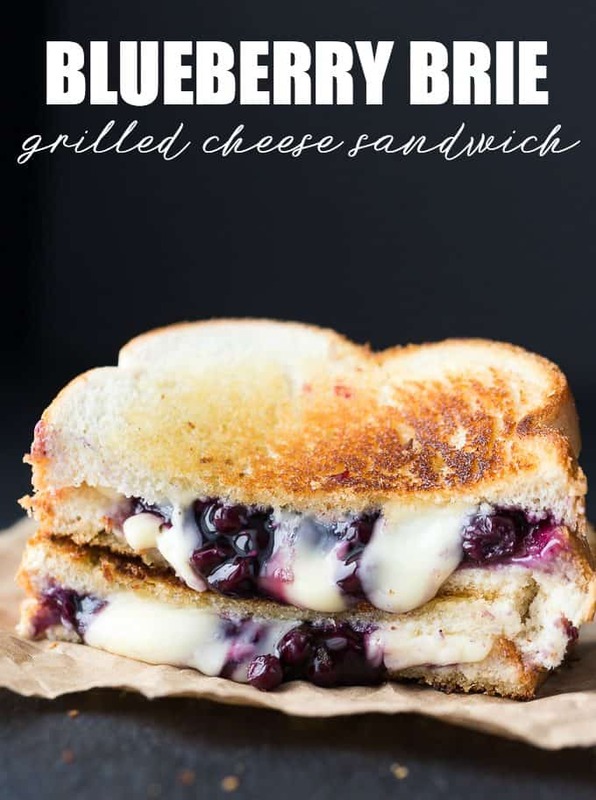 I love blueberries and grilled cheese but have never combined them in one sandwich. Can’t wait to make this. YUM! This looks really good. I need to give this a try. What a tasty combination! I totally need to give this a shot this weekend. I can just imagine the flavor explosion that this brings. I like the combination of blueberries and cheese. That is unique and very tasty. Oooh, this is the dangerous one! Looks so yummy! OMG, totally drooling over here! This looks amazing. I would have never thought to put brie and blueberry together but i can see why it works. This looks so messy and SO yummy. I can’t wait to try this! I never would have thought of this combination, but I can see how it would work. I love brie, but do not eat it very much because it only seems to be around during special occasions. I think this would be a great recipe to try and a good excuse to have some brie in the house. oh! That looks amazing! I will have to try it! Oh my gosh, this looks absolutely scrumptious. I never thought of doing something like this as a dessert. I’ll need to pick up some of Dempster’s Honey Wheat bread. This sounds so delightfully different. I bet my husband would love this for breakfast. A good looking meal I could have a lunch today. Brie and Blueberry sound like the perfect pair to me. Of course I can’t think of too many things that wouldn’t go well with brie. Hi Stacie! I’m visiting via Miz Helen’s Country Cottage. 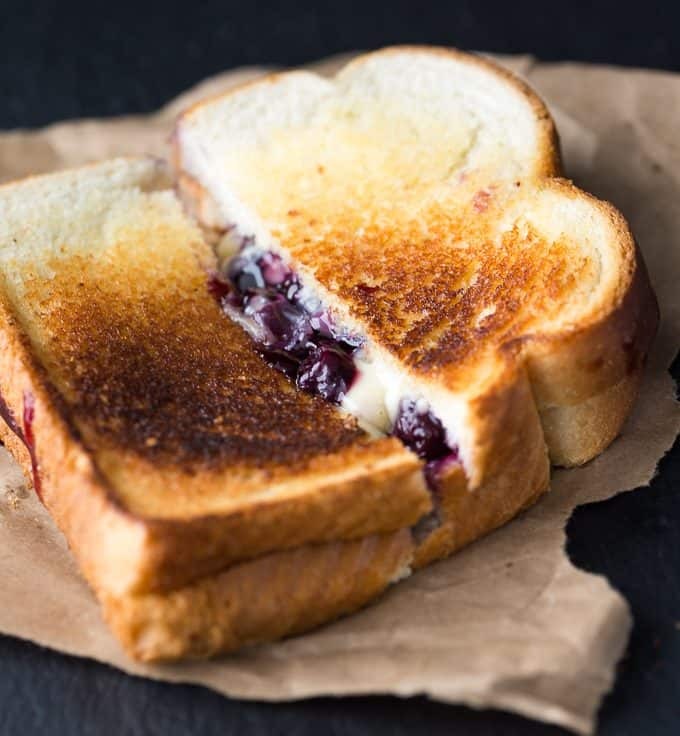 Love your Blueberry Brie Grilled Cheese Sandwich! I grew up in Ontario and my Mom always bought Dempster’s Bread. I can just imagine how tasty their Honey Wheat Variety is. You’ve certainly made a deliciously creative sandwich with it. My husband will love this and I’ve pinned it to try soon. If you have time, I’d love for you to share this yummy recipe with my weekly link party – Hearth and Soul. Hope to ‘see’ you there! 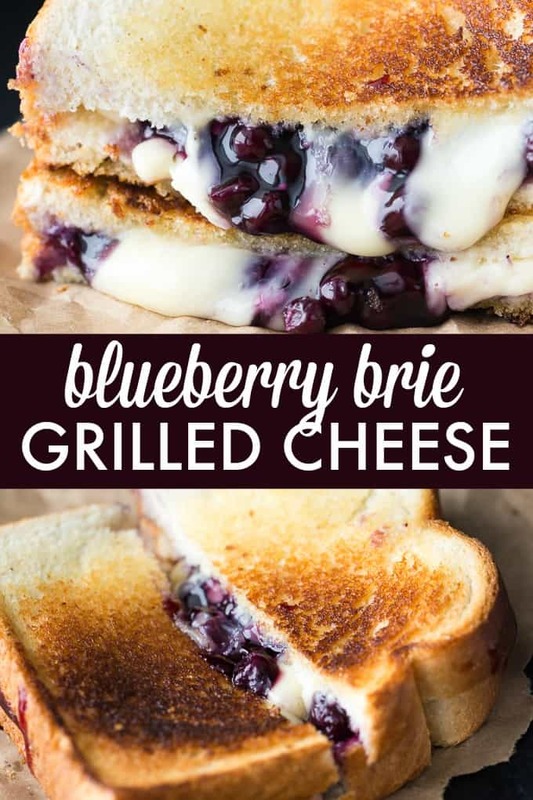 I love fruit with Brie cheese but have not tried blueberry yet, this would be great! Wow What a combination ! Love it ! I will try this recipe for sure , Thanks ! This is an interesting combination but it sounds like it tastes great! This sounds so delicious. I definitely want to try it. Yum, looks delicious!! Would be wonderful in a ladies lunch. No, I have not made a dessert sandwich before, but you have definitely inspired me with your incredible version. This looks so awesome! Thanks so much for sharing this yummy deliciousness with Celebrate It! I’m sooooo close to eating my mobile right now Stacie, these looks scrumptiously delicious. I can only imagine how yummy they must be in real life. Thanks so much for sharing this yummy sandwich with us at Full Plate Thursday. Hope you are having a good week and come back to see us real soon! Mmmm! What a great sandwich. Love these flavors! Thank you for sharing at Celebrate It! What a fabulous flavor combination. This post will be featured at the new Merry Monday party starting Sunday night in our fruity foods round up. Pinned. Thanks so much for sharing with us. I want one of these sandwiches for breakfast this morning!